Support the Boston Historical Society through AmazonSmile - They'll donate to our Society when you buy things through this link! Click or tap here to see the historical markers in our Town! The Age of Boston Physically the town of Boston is very old. Scientists tell us that the shale rock which underlies this area was formed under the sea in the Devonian age about 280,000,000 years ago. Later the land was raised up so that before the glacial period, our hills were higher by possibly 1,800 feet than they are at present. When the great ice sheet came down from the north and overran Western New York, its great weight depressed the land and it has never come back to its preglacial elevation. Then too, the glacier planed off the top of the hills to a considerable extent. Eighteen Mile Creek existed before the ice age but its valley was narrower than at present, and it flowed into a river which went southwest through was is now Lake Erie, and into the Mississippi River. The Glaciers Came During the glacial period, which began about 750,000 to 100,000 years ago, the ice sheet moved up Eighteen Mile Creek valley and must have dammed up the stream and at one time drained into Cattaraugus Creek near Springville. At the most southerly advance of the ice, it reached a point south of Boston near the Pennsylvania line. There were four or five major advances with warm interglacial intervals, probably covering many thousands of years. The high ridge of the hill south of the Cattaraugus Creek is a moraine deposited by the last major advance of the ice, which is known as the Wisconsin Glaciation. Each advance of the ice up the Boston valley widened and deepened the valley and cut away the spurs between the tributary creeks on each side so that it was gradually converted from a “V” shaped stream valley into a “U” shaped glacial valley. The Glacier Melted Whenever the glacier receded, melting under warmer conditions, it dropped its load of earth and rocks that it had pushed ahead of itself as it came down from the north. This accounts for the boulders of granite brought from Canada and found all over this area. The earth from the glacier also washed into the soil and the lake which was backed up in the valley behind the retreating glacier. The soil in the lake settled to form the wide flat floor of our valley. Some idea of the depth and size of this lake may be had by observing the valley out across the western hill, crossed by Zimmerman and Feddick Roads, where the outlet of this glacial lake overflowed west and down the valley of Hampton Brook. The last glacier probably melted in Boston Valley about 8,000 to 10,000 years ago. What a desolate landscape our hills and valley must have been! Not a blade of grass nor tree nor shrub, but only mud, gravel and rocks everywhere. Gradually (we suppose) seeds were brought in by the birds and winds, and vegetation was re-established. As the centuries passed, a forest of mixed hardwoods and evergreens covered the land and animals and birds became abundant. The First Visitors It was probably 4,500 years after the ice disappeared, or 5,500 years ago, when the first human beings visited the valley. These early visitors were not the Indians that the settlers encountered, but a more primitive people who knew nothing of farming or pottery making. They lived by hunting everything edible; berries, nuts, shellfish, snails, fish, and game. This kind of life required them to move frequently to find more food, so they had no settled life and move to wherever food was to be found. Such food as they cooked was roasted over a fire or “stone boiled” by dropping heated stones into bark, skin, or basketry containers to boil the contents. When the hot stones dropped into cold water, they often split and these split stones are found at sites all along Eighteen Mile Creek. Fish were caught with barbless fish-hooks, spears, and probably nets, and notched stone sinkers are sometimes found. Acorns and other vegetal foods were ground on shallow stone mortars, millers, or hand grinding stones to form a kind of flour. All these artifacts have been found in the valley. Skins probably provided the only clothing, and their weapons were rather crude. The First Residents Later than these primitive people were the “woodland people” who practiced some farming, made pottery, and made and smoked clay pipes. They may have come into this region from the south and southwest where higher cultures were developing. Probably these Indians came in about 3,000 years ago and were related to the “mound builders” of the Midwest. They raised corn and beans and were therefore more inclined to live in permanent villages than the earlier people. However, as the game was killed off and the agricultural land exhausted, they moved to new locations. Anthropologists are able to distinguish the artifacts of these different cultures. The Iroquois Before the Europeans arrived in this part of the country, the Indian living hereabouts were known as Eries, from whom our county and great lake are named. Neuters and Wenroes, all related to the Iroquois, formed the Five Nations of the area to the east. Trouble arose between these Indians and the other Iroquois, and in 1654 the Eries were exterminated. From then until the Sullivan expedition of the Revolutionary period destroyed their power, the Iroquois Five Nations ruled west of the Hudson River with the Seneca Tribe dominant in this area. The Iroquois Indians, known as Indians of the Long House, built houses of poles and bark in villages, which were sometimes palisaded by setting up logs twenty or more feet high. These palisades were further strengthened by piling earth against them on the inside and outside. The total population of the Five Nations at the time when the first Europeans arrived is estimated at 5,500, and have been only a scattered occupation of this area. Where a village existed for any length of time there is bound to be an accumulation of broken pottery, lost tools and weapons, and when the village was abandoned or burned, there is a surviving ridge of earth where the palisade had been. An Indian Village When the first settler arrived in Boston and built his cabin about where Liebler Road intersects Old Route 219, old records tell us that nearby was an opening in the forest of about thirty acres, except for a few trees. Here was an earthen embankment about two feet high, with a ditch on the outside about two feet deep, enclosing a space of about two and a half acres. There were a few trees growing on the embankment, one of them being a chestnut from two and two to two and a half feet in diameter. This undoubtedly marked the site of an old palisaded village and may have been in what is now Patchin. It is also recorded that there was a trail from this site to where Hamburg now is and from there along the ridge where Pleasant Avenue leads to the lake. By the time the settlers arrived here the Indians were living on reservations at Buffalo, Cattaraugus Creek or elsewhere, but occasionally they would pass through the valley. Their warfare days were over and they were harmless, except for petty thievery. The Wilderness When the nineteenth century opened on this area the hills and valleys were covered with a dense growth of hardwoods, pines and hemlocks. Much of the valley was swampy and almost impenetrable but there were some exceptions. Charles Johnson, who arrived in 1803, chose his land because there was an opening in the forest of about fifty acres that he could put under cultivation without the labor of clearing it. Most of the settlers had to cut and burn the trees before they could sow wheat or corn. As there was no market for lumber, in fact no saw mill within reach, the trees were cut and as soon as dry enough, were burned. This had its advantages as the wood ashes could be gathered and water leached through them to secure lye, which could then be boiled down to produce “black salts” or potash that could be sold. This was often the first and only cash-producing product which the settler could hope for until his crop of wheat or corn could be harvested. Meat could be had if the pioneer was handy with his gun. Deer, bear, raccoons, rabbits, partridges and wild turkeys were all present in the woods, and wildcats and wolves were ready to kill the cows if they wandered too far afield. Before the fields and pastures were cleared and fenced, all cattle wore bells to frighten off these animals and so that they could be located in the woods and brought home to yard or barn for the night. Bears were partial to pork, and the pig pen had to be high and strong to protect its occupants. The Land The Holland Land Company owned all this land and was so eager to sell it that credit was given to settlers if they would clear some land, build a cabin and raise crops. The settler “articled” his land; that is, he entered into a contract to make the required improvements on his land and to pay an agreed sum each year until principal and interest were paid in full, when he would receive his deed. Land about here was sold for from $2.00 to $2.50 per acre. Many settlers were never able to complete their contract and so either sold their interest in their claims or the land reverted to the company. Pioneering When the pioneer arrived at his selected home site, the first task was to fell trees and build a log cabin which would serve as a home until mills were built and he became prosperous enough to have frame buildings. The log cabin usually had holes for windows, sometimes covered with cloth in winter, as glass was an expensive luxury. A blanket often served for a door. A fireplace of stone or sticks and clay was usually built for a fire on the earth floor. How these hardy folks survived a winter is sometimes a mystery to we who live in warm, modern houses. Wood was the only fuel, but there was plenty of it. The man who could handle an axe could build his cabin, shelter his stock, fence his land, and provide fuel with no other tools. Oxen were preferred to horses because, although slow, they were strong and capable of hauling heavy loads. There were no roads until enough settlers had come to build them. Trails were followed and enough trees cut to let a cart or sled through. If the mud became too deep for passage, tree trunks were laid across to form a “corduroy road”. The First Settlers In the fall of 1803, brothers Charles and Oliver Johnson made the first purchase of land in Boston, paying $2.25 per acre. The following spring Charles came into the valley with his family and settled just south of where Liebler Road joins Old Route 219. Oliver Johnson, Samuel Eaton, and Samuel Beebe came a little later, settling nearby to the north. In 1805 Deacon Richard Cary, a veteran of the Revolutionary War, arrived with a sickly wife and eight children, settling just south of the Johnsons. He had three cents in his pocket and a debt of two dollars, but he eventually became a prosperous farmer. His first cabin was twelve feet square, with cloth windows and a blanket for a door, but it sheltered the family of ten. Both the Johnsons and Deacon Cary had to take their first crop of wheat forty miles to Chippewa to have it ground. In the following years came Jonathan Bump, Benjamin Whaley, Job Palmer, Ethan Howard, and Kester and Serrill Alger. The first frame barn was raised at Charles Johnson's in 1807. The following year Asa Cary, a brother of Richard, took up land south of his. Finally in 1809 a grist mill was wrected by Joseph Yaw, probably near where the Town of Boston now stands. 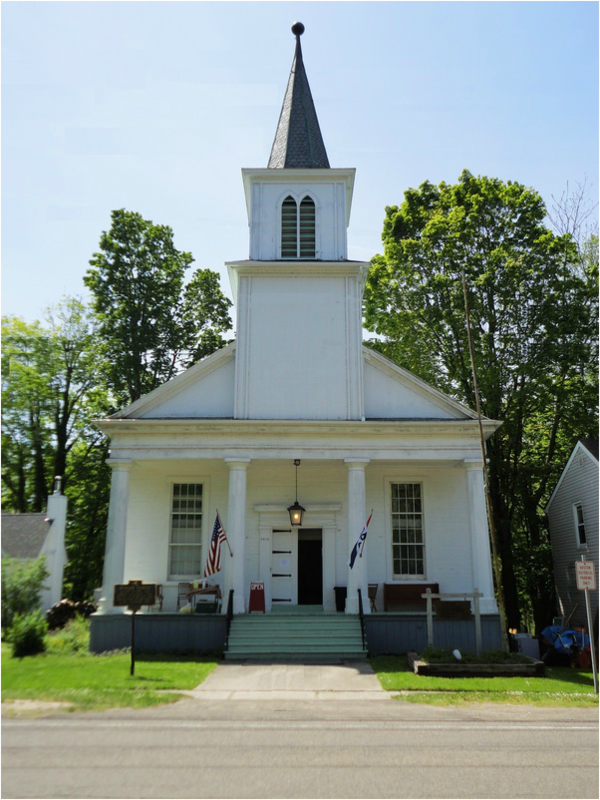 The First Church In 1811, a Free Will Baptist Church was organized and soon after built a church which stood east of Old Route 219 between Liebler Road and Maplewood Cemetery. Years later, when this church ceased to function, the building was moved to Patchin Road and converted into a hide house at a tannery. In this church the Rev. Cyrus Andrews preached for ten years. Another Baptist minister, Rev. Clark Carr, settled near the Concord line and preached around here throughout his life. The War of 1812 The War of 1812 brought dismay to the settlers, as it was feared that the Indians stirred by the British would raid the settlement. Charles Johnson (afterward Colonel) was Captain of the militia. Joseph Palmer's barn was stockaded; that is, and enclosure was built about the barn by erecting logs to form a primitive fort, as a place of refuge in case of need. When the British burned Buffalo, some of the men were there trying to defend the place. Deacon Cary's son Calvin, a twenty-one year old youth who weighed over three hundred pounds, was attacked by three Indians; he shot one, killed one with his clubbed musket, and was killed and scalped by the third. Soon after the war the Torrey family located in what is now the Town of Boston, long known as Torrey's Corners. Captain Torrey kept a tavern there and his sons Erastus and Uriah became prominent citizens. Talcutt Patchin, who served in the regular army and was wounded at the Battle of Chippewa, married a daughter of Richard Cary and settled north of the settlement that would later bear his name. 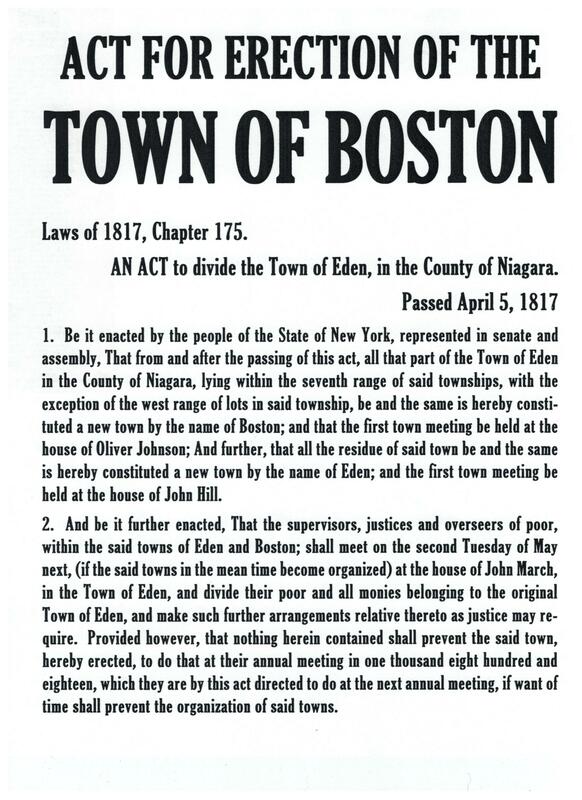 The Town is Formed The Town of Boston was formed on April 5th 1817 by dividing the Town of Eden. The name was doubtless borrowed from Massachusetts as New England place names are repeated in many states all the way to Oregon. The first town meeting was held the next year and Samuel Abbott was elected Supervisor. Other officers elected were; Town Clerk, two Poor Masters, three Assessors, four Commissioners of Highways, one Tax Collector, three Commissioners of Common Schools, two Constables and twelve Overseers of Highways. From this record it is clear that considerable settlement of the town had taken place and we read that there were one hundred and fifty-three taxable inhabitants in the town. It was voted to build a pound where stray animals could be kept until claimed by the owner, and Charles Johnson was elected Pound Master. Fifty dollars was to be raised by taxation to cover town expenses. Of course a dollar was of far greater value than in the twenty-first century, and dollars were very hard to come by. The following Quakers were taxed four dollars each in lieu of military service; Mathew Middleditch, John Kester, Stephen Kester, William Pound, David Laing, Thomas Twining Jr., Aaron Hampton, and James Miller. One result of this meeting was a law that , “Any person who shall suffer a stalk of Canada thistle to bloom on his or her lot or farm shall pay a fine of fifty cents for each blossom to any person suing for the same.” Evidently, there were weeds in the wilderness, and foreigners at that. Aaron Skinner In February 1818, Aaron Skinner, then twenty-one years old, started from Shelburne, Massachusetts to walk west to seek his fortune. He walked across part of Massachusetts and all of New York State, and from Buffalo walked on the ice on Lake Erie to Camp's tavern (near where Camp Road ends). From there, he and three other young men walked to White's Corners (Hamburg). He later wrote that the snow was so deep that there was no work and there was little money in circulation. He went to Batavia, probably walking, seeking employment but found none and so returned to White's Corners. When spring opened, he with Linus Dole, took the job of clearing land at $22.00 per acre of a man by the name of Coburn on Eighteen Mile Creek a mile or two above Johnsonburg, probably where the Johnson brothers lived. He taught school in North Boston and Boston in winter, and in summer worked on farms until he was able to buy a farm. Solomon Fosdick In 1819, Solomon Fosdick drove a covered wagon from Rensselaerville near Albany to Buffalo, and then out to Boston where he worked as a carpenter for many years. At first, the family lived in a log cabin east of Old Route 219, a little north of the intersection of the Boston Colden Road. “Living in a log cabin with nine children could not have been, even under the happiest circumstances, an easy arrangement,” wrote Raymond Fosdick, a lineal descendent. Later, the family moved to a frame house on Trevett Road near the town line. The Fosdicks were eager to advance themselves and Solomon taught his trade to three of his sons. Torrey's Corner's, with a population of perhaps twenty-five families, was beginning to show signs of future growth. Early Industries The first industry that was established in Boston seems to have been a distillery at Torrey's Corners around 1818. No license was required in those days, and drinking was very general. A mail route from Buffalo to Olean through Hamburg, Boston, and Concord was established in 1820, and a post office was opened at Torrey's Corners with the name of Boston. There was a tannery in Torrey's Corners and one on Patchin Road owned by a Mr. Stephens, and about this time Talcutt Patchin built another tannery here. The Churches A Presbyterian Church was organized here at an early date, and in 1837 Solomon Fosdick and his son, John Spencer, built the building which still stands on the west side of Old Route 219 in the Town of Boston. This building, known as St. Paul's, has been used by several denominations. As early as 1814, a Baptist organization existed in Torrey's Corners and in 1834, they erected a church building just south of where St. Paul's now stands, but this was torn down many years ago. The Methodist Church was not formed until 1824, and the Boston building was constructed in 1852. In 1857, a German United Evangelical Church was incorporated and bought the Presbyterian building and took the name St. Paul's Church. St. Martin's Lutheran Church on Cole Road was built in 1861, and in 1869, St. John the Baptist Roman Catholic Church was built on the Boston Cross Road. A Wet Fire Apropos this account of a distillery and the churches, a story comes down to us without documentation. It seems that in the 1850's, there was a tavern across the road from St. Paul's Church, and when it caught fire, the neighbors hurriedly formed a bucket brigade to fight the fire. Although they were unable to save the building, they did save the stock of liquor which was carried across to the church. The owner was so graeful for their efforts that he invited them all over to the church where they consumed the intoxicants. It was reported that they had such a merry time that it was necessary to redecorate the interior of the church after their revels. The Love Murder in North Boston John Twining and Benjamin Kester, with some other Quakers, settled at what came to be known as North Boston. A sawmill operated there as early as 1816 and a tavern soon after. There was a family of Thayers: the father, Israel Thayer and three sons: Nelson, Israel Jr., and Isaac. They were a poor family and had borrowed money from a boarder, John Love. He lived with them when not sailing the lakes in summer or peddling in winter. In the fall of 1824, John Love disappeared after staying for a time with the Thayers. Soon after this, the Thayer boys were observed to have more money to spend than formerly, and to be riding Love's horse about. When questioned they said that he was away, but had given them the use of the horse. Shortly after this they tried to collect debts owed to Love, and when they produced a power of attorney which was obviously forged, suspicion of foul play was aroused. The authorities offered a reward of ten dollars, quite a sum in those days, to anyone who could find Love's body. After an all day search it was found a few yards from the cabin of Israel Jr., where it was buried in a shallow grave with some brush thrown over it. This was in the gully between the present Zimmerman and Heinrich Roads. All four Thayers were arrested and the boys confessed that they had murdered John Love. The father was freed, but the three sons were hung on the west side of Niagara Square in Buffalo on June 7th, 1825. The execution attracted a large crowd to whom a sermon was preached before the hanging. This story is the most widely known event in the history of Boston. Epidemic in North Boston A post office was opened in North Boston in 1832. In 1843, there were nineteen families living here, totaling forty-three people. In the fall of that year, an epidemic occurred in which twenty-eight people were taken ill and ten died. An investigation showed that all these families but one were using water from a well at a tavern. One man had quarreled with the inn keeper, and his family secured their water elsewhere and was the only family to escape the illness. It was learned that a traveler had died of typhoid fever at the tavern shortly before the epidemic and that it was this disease which was prevalent. Without any doubt, the well had become contaminated and had spread the disease but apparently that was not understood at the time. We hope they closed the well. In any case, there seems to have been no recurrence. Politics in North Boston For several years following 1846, political conventions for the southern district of Erie County were held at North Boston by both parties. These brought many visitors to the town and enlivened the place considerably, but after the Erie Railroad was built through Hamburg, most of the conventions were held there. In 1840 a Quaker Meeting House was built. Later it was converted into a dwelling, now the home of Mrs. John Dominski. Schools We do not know when the first school was opened in the town, but since there were three Commissioners of Common Schools elected in 1818, there evidently were schools operating or contemplated. The early schools were very elementary and were open for only a few weeks in the year, as the children were kept busy at home most of the year. The Fosdick boys attended a school near where the Boston-Colden Road meets Old Route 219, and after finishing there, they walked to Springville to attend the Springville Academy. Trevett Road was the only route to Springville then, but a walk of over twenty miles a day did not seem too great a price for an education. There were no school buses and they did not need a gymnasium. Boston Centre The first settlement was made in the center of the township and this hamlet was called Boston Centre for many years. Here Talcutt Patchin operated his tannery for about ten years, and then he decided to try a fresh start in life. He took his wife and three children to Olean, where he built a flatboat and floated to New Orleans, going from there to that part of Mexico which later became Texas. 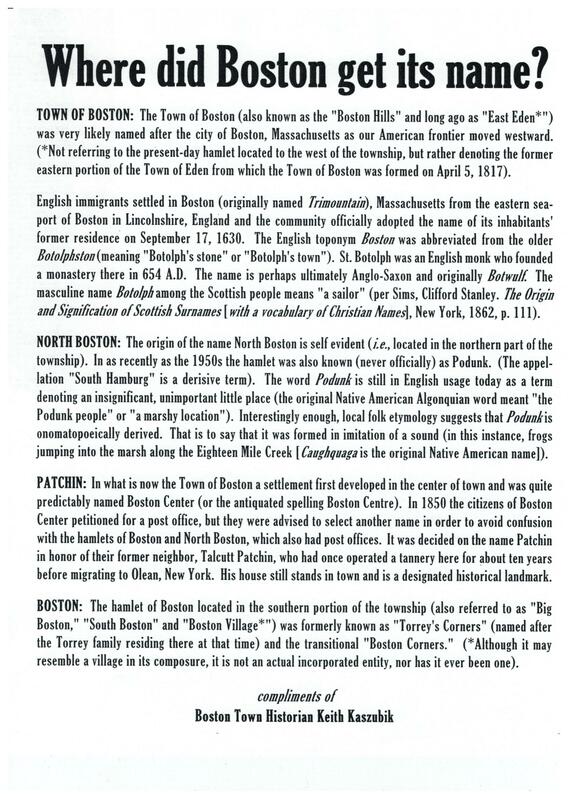 In 1850, the citizens of Boston Centre petitioned for a post office, but were told to select another name to avoid confusion with Boston and North Boston. They selected Patchin as the name of their post office in honor of their former neighbor who was gone but not forgotten. A Universalist Church Society was formed here in 1835, and before 1850 they had built a building, now the Town Hall. This building stood practically unused for over fifty years but was kept up by the Universalist Women's Sewing Society until taken over by the Community Church. Other farmers were raising sheep and a wool mill was busy just north of the Edgar Rockwood farm, 1.1 miles south of Patchin. Several saw mills and grist mills operated at various times along Eighteen Mile Creek but it is difficult to find any trace of them now. Civil War Times In the years before the Civil War, many Germans were coming to this country and several families came to Boston. Martin Keller had a tavern, a store, a blacksmith shop and a tailor shop in a little community of Germans on Feddick Road near Keller Road, but no trace of this community remains. The Bell Factory There used to be a bell factory in the Town of Boston, operated by the Yaw family. It was the largest bell factory in the United States, making five hundred cow and sheep bells a day, beside staples and hasps. We do not know when it started nor when it closed, but an atlas of 1866 shows the factory just below the Catholic Cemetery across the creek from Boston. Another atlas of 1880 shows that it had been moved east of the main road a little north of Boston Cross Road. There are a few of the old bells in the valley, but the business died when the farmers finished clearing and fencing their pastures. Distinguished Citizens Ambrose Yaw had a daughter, Ellen Beach Yaw, born in 1868, in the house east of Naber's store on Boston Cross Road, who was to become perhaps the widest known Bostonian. She developed a splendid voice and, after study in Europe, she traveled all over the United States and Europe doing concert singing. She sang soprano and could hit a higher note than any other singer at the time. She died in California where she had lived for several years. In the mid-nineteenth century, the brothers Orrin and Jesse Lockroad were prominent citizens. They lived in the house earlier occupied by Talcutt Patchin, now the Simmeth place, near Omphalius Road on Old Route 219. Orrin was Supervisor for several years, and later sheriff of the county. Jesse was a magistrate and justice of the sessions. Two other brothers were prominent in the county: Dr. T. T. Lockwood was an eminent physician and at one time mayor of Buffalo, and The Hon. Daniel H. Lockwood served as district attorney and member of Congress. Tanneries As hemlock trees were plentiful here and the bark was used to tan hides into leather, tanneries were built all over the country. There was a tannery before 1870 on the creek bank in the Town of Boston, and there were two others in Boston Centre. After the hemlock trees were cut off and chemical tanning developed, all these tanneries went out of business. Early Library The Boston Centre Library Association was formed in Patchin in 1889. This library was housed in the home of Thomas Cole in the back of a blacksmith shop on the northwest corner of Patchin Road and Old Route 219. Later it was in the home of Dr. Blanchard. After seven years, the library was closed and the books were divided among the members. The Road to Springville The road from Hamburg to Springville probably follows the old Indian trail as far as that extended, and beyond that point the early settlers blazed a trail following the route of least resistance. By 1812, a road was open to Springville, but from the bridge south of the Town of Boston, it followed the route of Trevett Road. It was not until 1840 or 1841 that the present route of Boston State Road was opened. As the road was the only means of contact with the larger settlements, it was a community project to maintain and improve it. Road taxes were worked out instead of being paid in cash. It was a narrow dirt road until about 1850, when a private company took it over and built a plank road for the use of which toll was collected. A toll house stood just north of Howard Cary's house, south of Liebler Road. Sawed timbers, three of four inches thick, were laid across the road forming a paved surface which, when new, seemed a great improvement over the mud and dust of the old highway. But the planks soon warped and curled up and broke in weak spots so that the road deteriorated rapidly. In ten or twelve years the company gave up trying to keep the road in repair and its upkeep reverted to the town. Probably much of it was buried under gravel. A few years ago the remains of this road was uncovered in a ditch several feet below the present highway. For many years the road was dusty in summer, muddy in spring and fall, and snow covered in winter. It sufficed for the horse drawn vehicles as residents of the town seldom traveled farther away than Buffalo. Finally in 1909, New York State took over this road and a paved road was built. This was when the advent of the automobile began to change the whole picture of the countryside. Growth of a village Before the days of paved roads and automobiles, the people of the town depended upon local stores and shops to supply their needs. Stores, taverns, and post offices had to be within easy driving distance of the farm, and this accounts for the three hamlets Boston, Patchin, and North Boston, each with its post office. About 1890, there were in the Town of Boston, the following places of business; one general store, a grocery store with the post office, four shoe shops, four blacksmith shops, two hotels, a wagon shop, a hardware and tin shop, a saw mill, a grist mill, a jewelry store, a harness shop, a meat market and a telegraph office. There was a doctor, a lawyer, carpenters and masons, all dependent on the patronage of those living in and around the village. A horse drawn stage ran from Hamburg to Springville daily. Several cheese factories operated outside the town within easy hauling distance of the farms, where milk was proving to be the best paying product. Oil and Gas The 1880, a pipeline had been laid from Pennsylvania to Buffalo to bring crude oil to the refinery. This line passes through Boston and is still in use, with a daily capacity of 5,000 barrels. Several wells were drilled n the town in the hope of striking oil but none were successful. It was several years later that gas producing wells were drilled, and there were several springs in Boston which gave off gas. The Horse Thief About 1890, there was excitement caused by the stealing of several horses. A vigilante committee was formed, officers elected, and the members were sworn in as deputy sheriffs. When in the fall, a valuable bay mare was stolen from Charles Churchill who lived on Old Route 219, 1.3 miles south of Patchin, the vigilantes went into action. They determined who the thief was, but it was some time in mid-winter before he was apprehended as he drove through Colden. As it was late in the day, the officer took his clothes away from him and locked him in a second story room at the hotel, intending to take him to jail in Buffalo in the morning. Some time in the night, the thief threw the bedclothes from the window, dropped into a snow bank, hitched up the horse and escaped. He was traced through Holland to South Wales, where the trail was lost. The next day his home was located near East Aurora and the stolen bedclothes were found under the barn. After watching the house two nights, he was almost caught when he drove in with groceries for his family. He escaped by running away, but a thaw had set in and he lost his boots in a muddy field. The next morning the searchers found a farm where he had told the farmer that he had lost his boots while hunting a lost cow, and had been given an old pair of boots. A day later, he was located, but again ran away before he could be caught. Although a reward of $50 was offered, he was never apprehended. Boston Fires On a cold night in 1903, a dance was in progress at Schunk's Hotel in Patchin when a fire broke out in the horse shed and spread to the hotel. Over a hundred guests vacated the hall, but some lost their overcoats and wraps, which caused considerable discomfort as it was twenty degrees below zero. The hotel and the town hall across the road burned down, but this prompted Fred Frank to organize the first fire company in North Boston. The Boston Fire Company was formed in the fall of 1908, and at a later date, a company was organized in Patchin. Beginning with old fashioned hand pumps, these companies have repeatedly acquired improved equipment until today when the town has three well equipped fire fighting organizations with a mutual aid arrangement. Through the years, there have been many fires in Boston, but most of them have been confined to one or two buildings. In 1893, several buildings burned in the Town of Boston, but the worst fire took place there on August 20th, 1920. Fire started shortly after midnight in the Boston Garage, where the village fire pumper was temporarily housed. Being unable to save the pumper left the fireman to form a hopeless bucket brigade. Calls went out to nearby places and their fireman responded. A call to Buffalo brought a fire engine from there. A flood had washed out two bridges in the valley, but in spite of that, the run from Buffalo was made in thirty-five minutes and the engine pumped from the creek onto the fire. However it was too late to save five buildings: Boston Garage, the house of Charles Hund, the two story Grange Hall, Schmitt's hotel, and the hotel of Jacob Michardzinski. The loss was estimated at $30,000. The Buffalo and Susquehanna Railroad In 1903, construction was started on a railroad through the Boston Valley. A steam shovel, donkey engines, and dump cars were brought in to make the cuts and fills to form a roadbed along the eastern hillside. Building a trestle across the gullies made most of the fills and dumped earth from them, but at Landon Brook, south of the Town of Boston, the gully was so deep that cables were stretched across and tracks laid on them instead of building a trestle. In 1906, people were delighted when the Goodyear brothers of Buffalo began operating the railroad from Buffalo to Wellsville. This railroad formed a connection between railroads, saw mills, and coal mines owned by the Goodyears in Pennsylvania, and their docks and steamships on the lakes. It was advertised as the “scenic route” and was busy with both passenger and freight traffic, but it lasted only ten years as the whole Goodyear empire began to crumble. In 1916, the tracks and bridges were sold as junk at wartime prices, and later most of it was shipped to France but it is said that part of it was sunk in the Atlantic by German submarines. The loss of the railroad was a dire blow to the prosperity and shipping facilities arose to take its place. The Boston Valley Telephone Company When the railroad was being built in 1904, the contractor on this section wanted a telephone so that he would not have to drive to Hamburg each time he needed to contact his employer or order supplies. He interested Frank X. Weber, and together they visited the telephone companies in Hamburg and Buffalo but they were not willing to extend their lines as they did not think there would have enough subscribers to make a line pay. Frank X. Weber, Fred Frank, and Jacob Broadbeck organized the Boston Valley Telephone Company and sold shares for $10, only one to a person. These men, with some help, set the poles and strung the wires. Mr. Corbit, the railroad contractor, was the first to have a telephone installed. It was planned to have one telephone each in North Boston, Patchin, and Boston, but by the time the line was finished, there were several subscribers. Eventually, there were seventeen lines extending as far as Colden, West Falls, New Oregon, and half way to Springville. In 1925, there were 342 telephones in operation, and 351 shares had been sold. This local company operated from 1905 to 1932 and paid an average dividend of more that 10%. On January 1st , 1932 the Bell Telephone Company took over the lines after paying the stockholders $32,000. This local effort had paid off handsomely. Rural Free Delivery When, in 1908, the rural free delivery of mail was started in Boston, Howard Owen began delivering mail with a horse and buggy. He continued his daily rounds until 1957, but in the later years he used an automobile. During World War II, he published a monthly booklet, the Boston Valley News, which he mailed to everyone who was in service from here. These booklets were much appreciated by the service men. Boston Creamery and Grange About 1909, the Boston Creamery Association opened a creamery on Boston Colden Road just off Old Route 219, to which many farmers brought their milk. This building has since been converted into a dwelling. In 1911, the Grange was organized with twenty-six members. After meeting in various places for four years, the Grange bought Hund's Hall in the Town of Boston. This building was destroyed by fire in 1920. As the Grange grew in membership, it became increasingly difficult to secure satisfactory meeting places, and in 1933, the present Grange building was started. Dedication took place October 14th , 1935. In 1936 they celebrated their silver anniversary. The Rockwood and Trevett families furnished more members than any other families, and Mrs. Eliza Trevett, who lived to the age of ninety-eight, was an active member. The Back Creek Murder History repeats itself, and in 1944, murder again occurred in our town. In a summer cottage on the Back Creek Road between North Boston and Patchin, Walter Nowicki of Blasdell, shot and killed Jacob Schmidt and his son, Lawrence Schmidt. He also wounded Miss Edna Halliday. The victims were all from Kenmore. Nowicki then turned the gun on himself with fatal result. A love triangle seems to have been the cause of the tragedy. Bicycle Races Each year the Boston Fire Companies have held a carnival to raise money to carry on their work. Beginning in 1949 and continuing until 1959, international bicycle races were held in connection with the carnival at Patchin. These were arranged by Ted Nowak and resulted in two Olympic trials and attracted considerable interest from sports fans. The Conservation Society In 1920, the Boston Rod and Gun Club was organized and in 1931, it became the Boston Valley Conservation Society. In 1949, a long club house was completed on Zimmerman Road. This building has served the community well, not the least among the activities centering there have been the many square dances. The Doctors The town has been exceedingly fortunate in the doctors who have served the ill and the ailing. Dr. Blanchard lived in Patchin for a long time, and later Dr. Jennings came to Boston Village. He traveled over the hills for miles around for nearly fifty-seven years, answering all calls of sickness and distress at any time of day or night, in all kinds of weather. Dr. Jehle also served for many years in the same village. More recently Dr. Hans Krakauner carried on in the same fine tradition until his death in 1961. Boston Free Library After the death of Dr. Jennings, a memorial library was started in the village of Boston in 1939, with Leland Dye as president. This library served for a time, but it was difficult to finance it adequately and its usefulness was limited. In 1947, a movement was started by George Stein, which resulted in the formation of the Boston Free Library Association. A library was opened in the old firehouse on Boston Colden Cross Road. In January 1949, this library became a part of the county system and since then has been operated under contract with the Buffalo and Erie County Public Library. In 1955, the library moved into the remodeled brick schoolhouse on the State Road. Later, the building was acquired by purchase from the school district. This library, with county assistance in financing, continues to grow and stimulate intellectual growth, especially among the children and younger residents. Boston Economy The economy of Boston has changed greatly over the years. After the difficult times of early settlement, it developed as a general farming area. Sheep, producing wool and mutton, were profitable for a time, but as the land was cleared and put under cultivation, it became evident that the hill farms were best adapted to milk production, potatoes, and cabbage, while the richer land of the valley was suitable for more diverse crops. Fruit growing became popular and at one time there were extensive apple orchards in the valley. As the hill farms were cultivated, the topsoil washed away and they became unproductive. Polish emigrants who by hard work and long hours have succeeded in making a living in spite of the poor soil, bought many of these farms on the west hill. Whereas in earlier times life on the farm was hard and social contacts few, the introduction of electricity for lighting and power (about 1922 in the valley and later on the hills), the telephone, radio, and television have revolutionized country living. Improved farming and milking machines have lightened the labor and improved communications have opened new vistas socially. Recent Changes Mrs. May Pingrey is believed to be the oldest living resident of the town. She has seen many changes during her lifetime. Automobiles have brought the city nearer and more and more of the residents of the town have found employment in the industries of the city to supplement or take the place of the farm. 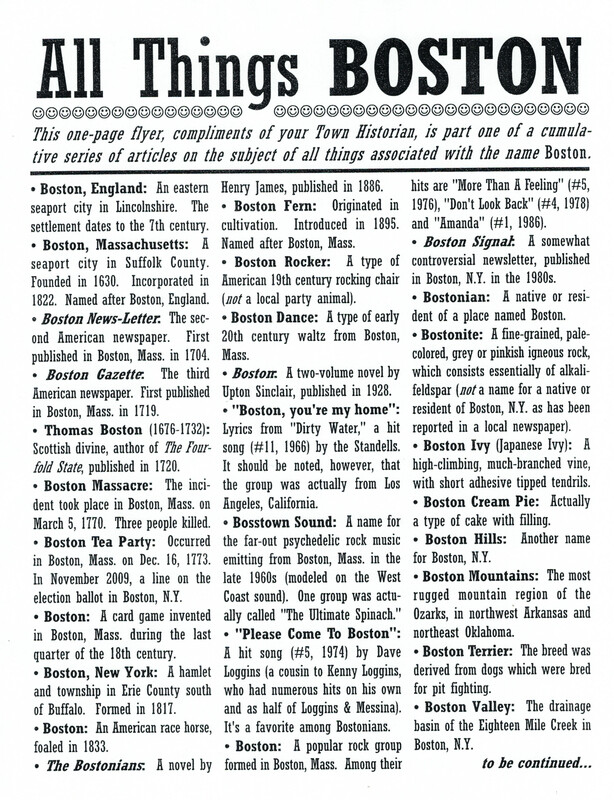 This has changed the character of Boston to a considerable degree. The beauty of our countryside has long been recognized, and many city dwellers are moving into the town, and building developments are wiping out the farm lands of the past. It now looks as if within a few years it will become a typical suburban community. The building of the modern elementary school in North Boston in 1959 marked a great advance in educational opportunity for the children. Because Boston has changed so much through the years and the new residents know so little of its past, this brief history has been written. This history may not be long or important to the nation, but it is worth preserving; and we who live here should be proud to be Bostonians. 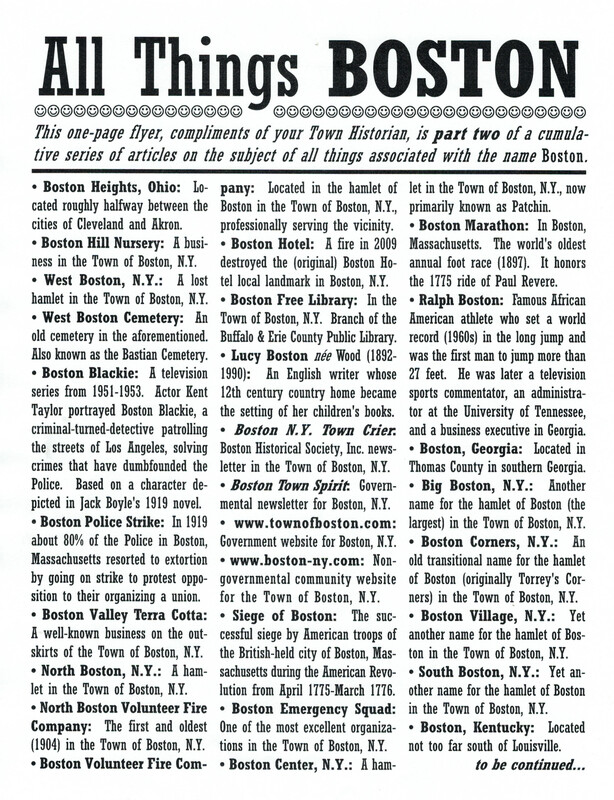 - The collected material of the Town Historian in Boston Free Library. - Reinstein, Julia Boyer, Historical Atlas of Cheektowaga.